K'ril Tsutsaroth is one of Zamorak's generals, and at level 650, is amongst the most fearsome beasts to ever have set foot upon Gielinor. Originally summoned by the Mahjarrat Bilrach, this demon would level entire villages, leaving almost no one to confirm his existence. 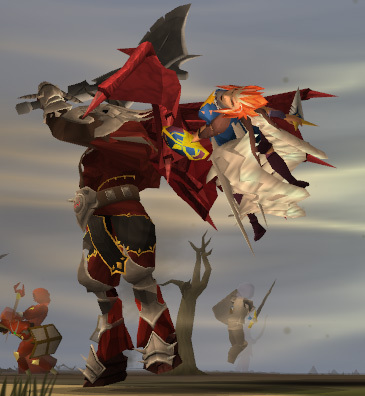 Such is the power of K'ril that even the mighty Commander Zilyana was overpowered and was almost dead after sparring with him. As stated earlier, K'ril is among the most dangerous monsters the player will ever encounter. However, he offers among the best money making methods in the game, averaging over 2 million coins as well as a healthy amount of 250k combat and 75k slayer xp per hour. 95 Prayer: For use of the Torment and Soul Split curses. The Penance Aura's usefulness at this boss cannot be understated. K'ril usually unloads his Prayer-draining attack on the player atleast once, and while Debilitate offers a way to cut the attack's damage by half, there is no way to reduce the prayer drain, which adds up and cuts trips short. The Penance Aura restores prayer points depending upon how much damage you take, which greatly helps counteract the Prayer-draining attack. Unlocking the Tier-2 aura reset from Death: This allows the player to recharge their Penance/Vampyrism aura, allowing for extra long trips. Alternatively, vis wax may be used. Some progress at the Dominion Tower: This unlocks a dominion marker, as well as dreadnips. The marker saves you space in the form of potions; it applies constant boosts to all your combat stats. The boost depends on your progress within the Tower itself. Note: While you certainly can melee K'ril with Drygores and get around the same kills per hour, this guide focuses on capitalizing his weakness to Fire Spells, and will not be talking about melee. It is highly recommended that the player own atleast a set of Subjugation Robes. Subjugation robes provide a good damage bonus, and as a bonus, count as Zamorakian items and boost the player's prayer points by 10 extra points per item every time they use the altar in the room. Sea Singer is also handy, exchanging offence for a life point bonus, which reduces the need to eat after K'ril uses his Prayer-Draining special attack. Virtus is even better, allowing for faster kills, and also provides protection from all factions at war in the God Wars Dungeon. Perfect for those who can afford it. It should be noted that damage is much more important than defence at this boss, and thus Tectonic and Virtus are preferred over Sea Singer. Nothing much to say here, use of dual wielding weapons also allows the player to bring a shield incase things turn sour. A shield may be used as a swap, it is NOT ADVISED to do the entire kill whilst equipping a shield. Wearing the Max Cape allows the player to quickly bank at the Max Guild in Prifddinas, and quickly teleport back using the portal there. If using a God Cape, Zamorak is the best choice as the player is rewarded with 10 bonus prayer points, which really lowers the consumption of prayer restoring potions over time. 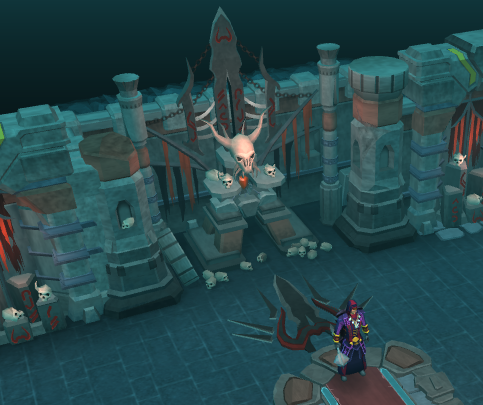 Prayer is the main concern whilst fighting K'ril Tsutsaroth. As there are no bones, players cannot make use of the Dungeoneering necklaces, and so will be relying more on potions and the altar here as compared to Kree'arra. Penance is thus HIGHLY recommended, as it goes a long way into counteracting the Prayer-Draining attack. Otherwise, use an upgraded version of the Poison Purge aura, or the Vampyrism/ Runic Accuracy auras. A Shard of Zaros should be equipped before entering the boss room, for immunity against all factions in the dungeon. Upon entering K'ril's private chambers, equip a Scrimshaw of the Elements, a Sign of Death or a Sign of Life, which will prove to be more useful in the actual boss fight. Only use the Amulet of Zealots if you intend on using Single-Stat boosting prayers like Overcharge. It is NOT recommended to bring items like an Amulet of Fury, as it is just an unnecessary risk. Everyone dies, and you want to risk as little as possible in the case of your death. The Unicorn Stallion's cure ability is very useful here, as K'ril can poison the player for up to 168 damage. Fill your Pack Yak with a few more spare pouches, and Super Restores and Sharks (balance the amount according to your personal needs) When using the Vampirism aura, prioritize prayer potions over food, and vice versa for the Penance aura. Sunshine: This Ultimate ability drastically increases your Kill Speed, especially if used at the very beginning of the kill after stalling adrenaline. Metamorphosis: If Sunshine is unavailable to the player, use Metamorphosis instead. While it lacks the additional damage-over-time effect of Sunshine, it makes up for it with the ability to move. Guthix's Balance: This Ultimate ability heals you 40% of your total health. Frequent use of this ability can prolong trips drastically. Please note, the butterfly can be killed by K'ril and his minions; if you need to heal during a kill, use the Ice Asylum ability, although this limits your movement and only heals you 35% of your total health. Sacrifice: This Basic ability can potentially heal you over 2,000 life points, if you have Sunshine/Metamorphosis activated, and use it on a minion who is close to dying. Dragon Breathe: When coupled with the Dragon Rider amulet, this is your most useful ability at K'ril. This is because it raises your adrenaline more than any other ability, and hits multiple targets. It also deals quite a large amount of damage for a Basic ability. A sample ability bar is: Wrack, Impact, Sonic Wave, Sacrifice, Combust, Dragon Fire, Chain, Asphyxiate, Wild Magic, Sunshine, Guthix' Blessing, the High Alchemy spell and the enhanced excalibur. Once you enter the God Wars Dungeon, run north until you see a broken bridge. Jump over it, and enter Zamorak's camp. Start killing the imps (there are 5 spawns) until you get 40 Kill count. Note that running across the bridge COMPLETELY DRAINS YOUR PRAYER. So when you're about to enter the boss room, drink a few doses of your super restore potions. If you plan on killing K'ril Tsutsaroth in a team, then there's an interesting method that could make your trip last infinitely long, assuming good enough gear is used. The most damage during the boss fight comes from K'ril's Prayer draining attack; however, if K'ril targets a player who has someone standing next to him (or on the same square) then the damage is split equally between both players. This reduces his 4,000 damage attack to a maximum of 2,000, and using Debilitate further drops it down to around 1,000- which is much more manageable. Always stand in the North-West corner of the room- the corner farthest from the Altar. This has two big advantages (three if in a team); the first is that Zakl'n Gritch, the minion who attacks using range (your weakness, according to the Combat Triangle) will spawn in the corner farthest from you and will probably not attack you. The second advantage is that this causes K'ril Tsutsaroth, Balfrug Kreeyath and Tstanon Karlak to surround you and stand within a square of each other- making the Dragon breathe and Chain abilities extra useful. This usually results in more kills per hour, leading to high profits. The third reason was mentioned above- having many people stand on the same square will split the damage between them. When K'ril is dead, kill the minions in this order: Balfrug Kreeyath > Zakl'n Gritch > Tstanon Karlak. Note that Balfrug and Karlak are almost always close to death after K'ril dies, if the player uses AoE abilities like Chain and Dragon breath. Sometimes, Zakl'n Gritch may be wandering in the far corner of the boss room, oblivious to the player. It's up to you whether or not you want to kill him when this happens. Always keep a few Sign of Respites in your bank! If you lose connection, like the player shown below, Signs of Respite prolong the timer on your grave, giving you plenty of time to get your items back. K'ril and his minions will always drop Infernal Ashes. Banking these can result in some good profit, but is rather tedious. His uncommon drops include items like Adamant Platebodies, Rune scimitars, Rune platelegs, around 20k coins at a time, noted Wines of Zamorak as well as noted Lantadyme herbs and seeds. However, that's not where most of the profit comes from. 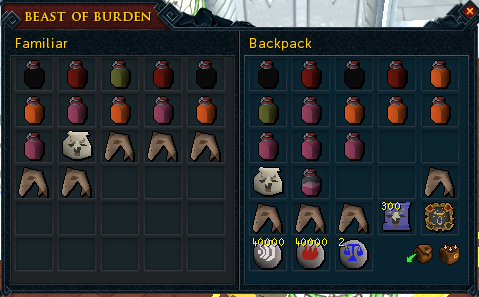 The majority of profit comes from K'ril's unique drops. These include the Subjugation and Warpriest armour sets, parts of the Godsword, the Zamorakian Spear, as well as parts of the legendary weapon that started the God Wars- the Godsword. Legend has it that this weapon was imbued with the power to kill a God. 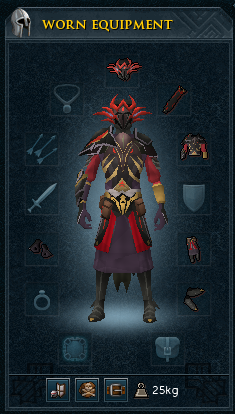 The Warpriest of Zamorak armour set is quite useful. Not only is it hybrid gear, but if the player is wearing three or more pieces of Warpriest armour, there is a 3-6% chance that whenever you take damage, the damage is reduced to 10% of the original damage. So if you were about to take 10,000 life points of damage, and the special ability activated, you would take 1,000 life points of damage instead. Talk about life saving! 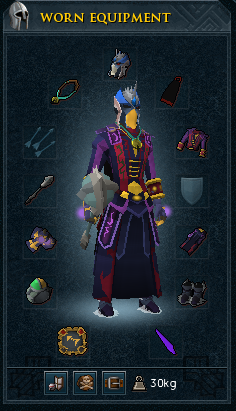 The Subjugation armour set is a set of non-degradeable Tier 70 magic power gear. If you wield the whole set, you deal extra damage equal to 10% of a level 70 weapon. 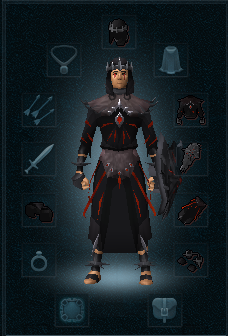 K'ril and his minions drop the Hood, Garb, Gown, Boots, Gloves, and Ward of Subjugation. On a slight side note, it's very infuriating to get a Ward of Subjugation or Steam Battlestaff drop. I've been there. And speaking as a PvMer who's had long streaks of bad luck, it's important to realize that every drop is precious, and no drop should be callously disregarded. So instead of ranting about getting a useless drop, it's better to quietly acknowledge you could have gotten a Zamorak brew drop. Cheer up! Better luck next time. And in all honesty, the world has bigger problems, with Sliske starting an all-out bloodiest between the Gods, and the threat of the Dragonkin looming over their battlefield.